China’s home-price recovery slowed in October, as a supply glut in less-prosperous cities challenges the authorities’ efforts to revive the residential market with interest-rate cuts and easing of mortgage restrictions. New-home prices increased in 27 cities, 12 fewer than in September, the National Bureau of Statistics said Wednesday. Prices dropped in 33 cities, compared with 21 in September, and were unchanged in 10. The number of unsold new homes nationwide increased 14 percent to 437 million square meters (4.7 billion square feet) as of Oct. 31 as the pace of home sales slowed, the statistics bureau said earlier this month. Chinese President Xi Jinping has vowed to “ease property inventory” after the government cut interest rates last month for the sixth time in a year. The central bank on Sept. 30 cut the mortgage down-payment requirement for first-time buyers in lower-tiered cities struggling with an oversupply of unsold homes by 5 percentage points to 25 percent. Prices in the financial hub of Shanghai led gains in the first-tier cities, up 1.8 percent from the previous month, the quickest pace in four months. Prices increased 1.2 percent in the southern trading hub of Shenzhen, moderating from 4 percent in September. They gained 0.6 percent in Beijing and 0.8 percent in Guangzhou, both slower than in the previous month. The recovery in prices is more mixed in second-tier cities. They advanced 1.3 percent in the southern tourist city of Xiamen and 1 percent in Nanjing, the fastest in more than two years. They dropped in Wuxi, a manufacturing hub west of Shanghai, after rising for two consecutive months. The price growth in both first- and second-tier cities “weakened” month-on-month, the statistics bureau said in a statement released with the data. Prices “started to fall” in the less-prosperous third-tier cities. Prices in October rose in 48 cities from the previous month among the 100 tracked by SouFun Holdings Ltd., which owns China’s biggest property website. That was 11 fewer than in September. Average new-home prices rose 0.3 percent in October from September when they climbed 0.28 percent. Housing sales gained 16 percent in October from last year, the same pace as in September, though narrower than monthly growth of above 30 percent in the May-to-August period, according to Bloomberg calculations based on official data released last week. New-home building starts, a leading indicator of real estate investment, slumped 24 percent last month from a year earlier, reversing a 17 percent gain in September, according to government data. Property investment increased 2 percent in the first 10 months from the same period last year, the slowest pace in more than five years. “The only explanation of the poor new-starts figure is that sales in third- and fourth-tier cities are not smooth, while inventory pressure is enormous,” Beijing-based China International Capital Corp. analyst Ning Jingbian wrote in a Nov. 11 note. He cut his forecast for full-year new starts by 2 percentage points to a decline of 12 percent. China is hoping investments in the nation’s 40 largest cities, which the statistics bureau has called “market stabilizers,” will prop up investment nationwide. 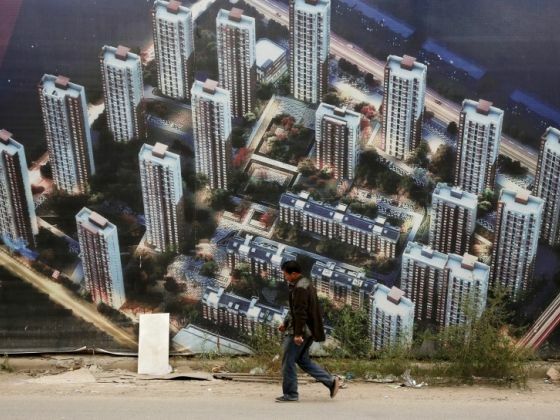 China Vanke Co., the country’s largest residential developer, sped up land purchases, buying 19 projects in October mostly in second-tier cities such as Hangzhou, it said in a Nov. 3 filing to the Hong Kong stock exchange. A glut of homes in cities outside of the four first-tier ones will prevent prices from rebounding in 2016 despite policy support, Du Jinsong, a Hong Kong-based property analyst at Credit Suisse Group AG, wrote in a Nov. 12 note. The average price of the 70 cities rose 0.07 percent in October from September, the slowest monthly gain since June, according to Bloomberg calculations based on official data. New-home prices rose in 16 cities in October from a year earlier, more than the 12 in September. Existing-home prices rose last month in 38 cities from the previous month, little changed from the 39 in September.